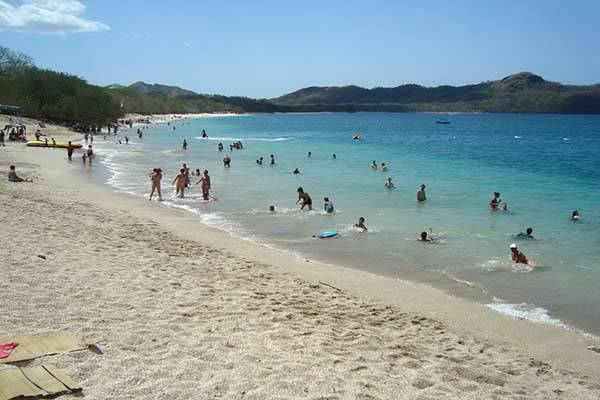 Considered to be one of the most exotic and prettiest beaches on the Costa Rican Gold Coast, Playa Conchal which means “shell beach” is located on the northwest Pacific Coast of Guanacaste, approximately 25 minutes north of Tamarindo and just south of Flamingo. If you fly into Liberia it is less than an hour away and it’s a four-hour drive from San Jose. This one-and-a-half-mile beach was named Conchal because the sand consists of super-finely ground shells, which feel like sand, but does not stick to your wet skin in the same manner as regular sand. These white shells sparkle like diamonds in the sunshine. In contrast to the white sand, the water is turquoise-blue in color, deceiving visitors into believing they are on the Caribbean Coast. Many beach goers enjoy snorkeling because of the clarity of the water and gentler waves compared to some of the nearby surfing beaches. The tropical fish in this area are stunning and occasionally you can see sting rays swim nearby. The water is a comfortable temperature for swimming year-round. Since Guanacaste is the most arid province in the country, Conchal enjoys more sunshine than most of the coastal areas to the south. Typically, without a drop of rain December through May and only stray afternoon showers June to August. There is not actually a town called “Conchal”, which is unusual compared to many of the other popular expat beaches. The closest town is about one-and-a-half miles away in Brasilito. Visitors used to be able to drive along the beach from downtown Brasilito to Conchal. However, in 2018 the municipality closed the road to vehicular traffic, so the only way to get to the beach from town now is to walk. The lack of cars and number of people has now created a beautiful tranquility to Playa Conchal. Although the “town” of Conchal is nonexistent, there are several expats who live in Reserva Conchal. This development consists of an enclave of high-end townhouses, stand-alone homes, and condos in different “neighborhoods” situated around an Audubon-certified, Robert Trent Jones II 18-hole golf course—one of the top courses in the country. 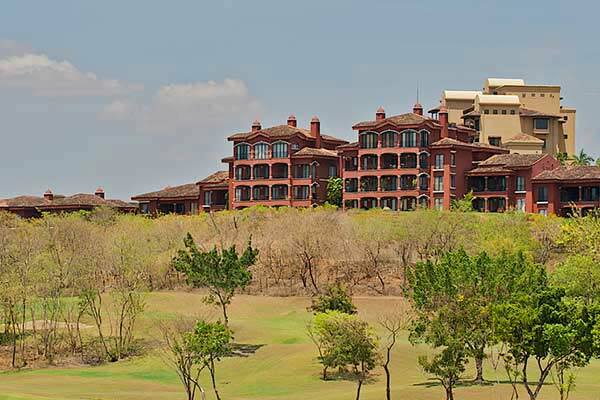 In fact, it was the chosen course for the Latin American PGA Costa Rica tour. The contract for the tournament runs from 2017 to 2019 with the tournament taking place in May. The development also boasts an all-inclusive luxury Westin hotel, and the first W Hotel in Costa Rica, which opened in November 2018. 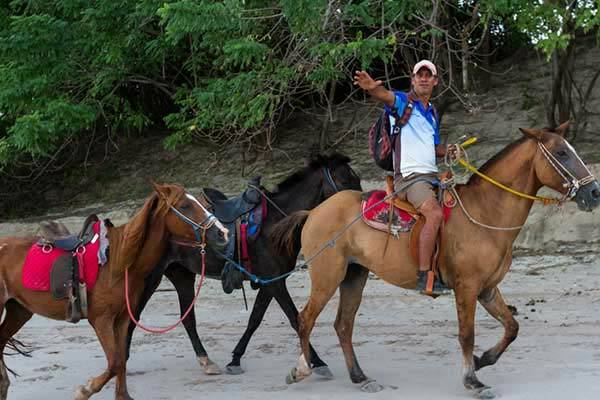 Conchal is also located within an hour to several national parks and most outdoor activities synonymous with Costa Rica; such as zip lining, horseback riding, sailing, diving, nature hiking, birding, and deep-sea fishing, etc. If you are looking for a golf community type of lifestyle with all the creature comforts, extravagance, and security of North America, Conchal might be of interest. Members of the posh beach club located on the shores of the Pacific Ocean directly on Playa Conchal have use of a fitness club, tennis courts, miles of hike, and bike trails, plus discounts at the hotel’s 13 restaurants and bars. The closest major medical facilities, both public and private, are in Liberia, which is about an hour’s drive from Conchal. Liberia is also the main hub for major shopping such as home furnishings, auto dealerships, etc. The city also possesses an immigration office, driver’s license office, annual car inspection facility, major provincial capital government offices, and the country’s second international airport (LIR). Thus, making trips all the way to San Jose unnecessary to conduct business or shop. If you do not own a car Conchal is on the bus route to Liberia and south to Tamarindo. For day-to-day living, everything is within 30 minutes or less. The area’s most comprehensive small medical clinic which has a lab and x-ray machine is 10 minutes away in Huacas and banking can be done in Flamingo, just a five-minute drive away. Smaller grocery stores and pharmacies are in nearby Brasilito and Flamingo—plus larger grocers: Super Compro in Huacas, Mega Super & Maxi Pali in Villa Real, and AutoMercado in Tamarindo. Reserva Conchal is a family friendly community within five minutes of Guanacaste’s two well respected international private K-12 schools—CRIA (Costa Rica International Academy) and La Paz. Expats are attracted to Conchal specifically for the amenities, security, cleanliness, the beach, eco-friendly building materials, and water usage, and its proximity to everything the Gold Coast has to offer. If you choose to live here it is suggested to own a car, quad or some sort of vehicle to drive to the nearby towns for shopping, medical clinics, and general commerce. It is nearly impossible to know the exact population of Conchal, since it is not an official town and they do not have census numbers. Of the over 160 current residents in Reserva Conchal, the mix is estimated 90% Gringos and 10% ticos (Costa Ricans). Many homes and condos here are used as a second home or a vacation rental investment. Housing options include furnished condos (many with ocean or golf-course views) starting at $280,00 for a studio, $300,000 for a one-bedroom, $375,000 for a two-bedroom, and $425,000 for a three-bedroom. Two of the neighborhoods have luxurious free-standing four-bedroom homes ranging from $700,000 to $1.5 million. Three-bedroom townhomes are in the $650,000 range. HOA fees range from $385 to $500 a month and include security, common grounds and pools maintenance, water, and garbage. Beach club membership is $150 a month and includes a discount of 25% off food and spa. Ocean-view lots are currently available priced at $197,000. investments. Rentals are furnished and typically include utilities. For example, a two-bedroom, two-and-half-bathroom rents for $2,300 a month, and a four-bedroom would be in the $4,000 a month range. Often, these prices are negotiable, so it is always good to ask. In nearby Brasilito you can rent in the $700 to $1,200 range bringing down your monthly expenditures significantly.